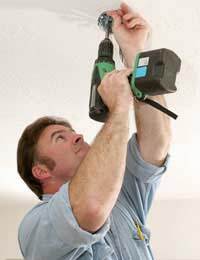 If you need to get some electrical work done on your bed and breakfast then it is even more important that you use a properly trained electrician than with a private house. Electricity is dangerous stuff and if you can be shown to have been negligent and there is a fire or other disaster, then even if you escape with your life you could be in for a tough time if guests decide to sue. Quite apart from that the government has steadily tightened the legislation surrounding electrical work in homes and businesses and a bed and breakfast has more requirements than the ordinary house. Recent legislation has made it almost impossible for anyone to work on electrical systems without being fully qualified. You can still swap out light fittings and sockets but working on any other part of the electrics in your B&B is going to be difficult. It's not impossible, but what you would have to do is get the building control inspector in before and after the work to have it certified (perhaps even during as well, if it's a major job). On balance, it's probably easier to get a qualified electrician in. Look for qualified electricians in the phone book and through the industry bodies as well, although personal recommendations are always good for any professional service. Don't be scared to ask to see certificates of qualification and make sure people are insured too. It might be a pain in the neck, but in these litigious days you can't be too careful. If you don’t make the checks then you may be liable if there's a problem later on and the electrician or electrical contractor you used turns out not to be properly qualified or certified after all. When you're looking to use someone for the first time it's best not to use the first person you find. Check out at least three people or companies and get quotes from them all, but also watch how they work when you get them round. While they're looking at the job see whether or not they are listening to what you're saying and how they respond to your questions. You are going to need someone that you can work with because you may need to use them again in the years to come. If it's a sizable job such as re-wiring or fitting out a new extension then you need to be asking the electrician, or electrical contractor, about work they have done, for other B&B's in the area if possible. You should then ask if you can go along and see those previous customers and get an opinion from them. If any of your candidates baulk at this then drop them from your short-list as there's obviously something to hide. Finally, if it's is a big job, you really need to get an electrician or electrical contractor who's up to speed with the latest regulations specifically for bed and breakfasts and small hotels. Establishments like this need more fittings, perhaps emergency lighting or other extras and if you employ an electrician who doesn’t know the rules you could come a cropper.